Abstract met ook interessante referentielijst staat onderaan dit artikel. Van de inmiddels 53 patienten (allemaal borstkanker stadium IIIa - N = 10 of IIIb N = 24 of IIIc - N = 19) (N = 10, bereikten 7 patiënten een CR - complete remissie (13.2%); 41 patiënten ervaarden een PR - gedeeltelijke remissie (PR = 50% of meer vermindering van tumorgrootte en aantal) (77.4%), met een hazard ratio van effectiviteit samen van (CR + PR: 90.6%, 48/53); 5 patiënten behielden SD = stabiele ziekte (9.4%) en niemand kreeg progressie van de ziekte tijdens de behandelingen. 19 juli 2011: vorig jaar werden resultaten met Resaic - redistributed subclavian arterial infusion chemotherapy, oftewel chemo embolisatie bij borstkanker naar buiten gebracht. Recent zijn ook de resultaten van een fase I studie bij 22 patienten met chemo resistente uitgezaaide borstkanker gepubliceerd die een significant positief effect te zien geven. Er werd bij 77% alsnog een respons gezien en de toxiciteit was slechts bij 6 van de 22 patienten graad 3 , maar wel ook nog behandelbaar. Op zich dus een bemoedigend resultaat. Wel opvallend dat alleen in Japan in 1 kliniek met deze methode wordt gewerkt. Althans ik kan verder niets vinden in pubmed over deze nieuwe vorm van chemo embolisatie bij gevorderde borstkanker. Onderaan staat nieuwe abstract. Resaic (redistributed subclavian arterial infusion chemotherapy) een vorm van Arteriele chemo embolisatie bij borstkanker geeft bemoedigende resultaten. Dit blijkt uit een fase I/II studie uitgevoerd door Japanse onderzoekers. Elf patiënten ondergingen RESAIC, en de complete remissie en gedeeltelijke respons op 10 evalueerbare patiënten was 90%: complete remissie n = 4, partiële remissie n = 4, stabiele ziekte, n = 1, en niet evalueerbaar n = 1. Drie van de vier patiënten met CR had geen metastasen op afstand, en de gemodificeerde radicale mastectomie werd uitgevoerd1 maand na het beeindigen van RESAIC. Het via een biopt genomen weefsel toonde geen resterende kankercellen en bevestigde de complete remissie die eerder werd gediagnosteerd in elk van deze gevallen. Hoewel tijdelijke graad-3 myelosuppressie werd waargenomen bij drie patiënten die eerder zijn behandeld door systemische chemotherapie, waren er geen andere medicijn-gerelateerde bijwerkingen of behandelings gerelateerde complicaties. RESAIC gaf een betere respons te zien en toonde geen grote complicaties in vergelijking met andere behandelingen, ondanks het vergevorderde stadium van de kanker. Development of a new subclavian arterial infusion chemotherapy method for locally or recurrent advanced breast cancer using an implanted catheter-port system after redistribution of arterial tumor supply. Takizawa K, Shimamoto H, Ogawa Y, Yoshimatsu M, Yagihashi K, Nakajima Y, Kitanosono T.
Locally or recurrent advanced breast cancers can receive arterial blood supply from various arteries, such as the internal thoracic artery (ITA), the lateral thoracic artery, and the other small arterial branches originating from the subclavian artery. Failure to catheterize and subsequent formation of collateral arterial blood supply from various arteries are some of the reasons why the response to conventional selective transarterial infusion chemotherapy is limited and variable. To overcome this problem, we developed a new subclavian arterial infusion chemotherapy method using an implanted catheter-port system after redistribution of arterial tumor blood supply by embolizing the ITA. We named this technique ("redistributed subclavian arterial infusion chemotherapy" (RESAIC)). Using RESAIC, patients can be treated on an outpatient basis for extended periods of time. Eleven patients underwent RESAIC, and the complete remission and partial response rate in 10 evaluable patients was 90%: complete remission n = 4, partial remission n = 4, stable disease n = 1, and not evaluable n = 1. Three of four patients with CR had no distant metastasis, and modified radical mastectomy was performed 1 month after conclusion of RESAIC. The resected specimens showed no residual cancer cells, and pathologically confirmed complete remission was diagnosed in each of these cases. Although temporary grade-3 myelosuppression was seen in three patients who were previously treated by systemic chemotherapy, there was no other drug-induced toxicity or procedure-related complications. RESAIC produced a better response and showed no major complications compared with other studies despite the advanced stage of the cancers. Jpn J Radiol. 2011 May;29(4):236-43. Epub 2011 May 24. Clinical efficacy and value of redistributed subclavian arterial infusion chemotherapy for locally advanced breast cancer. Shimamoto H, Takizawa K, Ogawa Y, Yoshimatsu M, Yagihashi K, Okazaki H, Kanemaki Y, Nakajima Y, Ohta T, Ogata H, Fukuda M.
The aim of this study was to evaluate the efficacy and safety of redistributed subclavian arterial infusion chemotherapy (RESAIC). We have focused on the local response, quality of life (QOL), and complications. We have also investigated factors that influence the local response of RESAIC. The subjects were patients with locally advanced breast cancer whose tumors were resistant to standard systemic chemotherapy (at least more than two regimens), those who were physically unable to tolerate systemic chemotherapy, and patients with locally recurrent breast cancer. The registration period was between April 2006 and May 2009. A total of 24 cases in 22 patients (mean age 59.5 years, range 36-82 years) were entered in the study. The local response rate of RESAIC was 77.3% (17/22). The QOL score showed improvement on average. There were no serious complications during catheter port implantation, and there was hematological toxicity over grade 3 in 27.3% (6/22) of patients. A significant difference between responders and nonresponders was seen in patients with a replaced type tumor (on imaging, diffuse contrast enhancement was seen in whole quadrants) (P = 0.043), and the patients underwent radiotherapy (P = 0.043). RESAIC is an effective, safe treatment for locally advanced breast cancer. Because it was reviewed in only a few cases, however, large-scale studies are warranted. Mol Clin Oncol. 2013 Jul;1(4):745-748. Epub 2013 May 23. Main complications and results of treatment with intra-arterial infusion chemotherapy through the subclavian and thoracic arteries for locally advanced breast cancer. Wang X1, Gan C1, Li H1, Wei Y1, Zhu D1, Yang G1, Su X1, Rodier JF2, Ren G1. Intra-arterial infusion chemotherapy for locally advanced breast cancer (LABC) has been previously performed. However, the main complications of this type of chemotherapy remain to be clarified. In the present study, catheterization chemotherapy was carried out for 53 LABC cases (stage IIIa-IIIc) between May, 2006 and March, 2007. For IIIB and IIIC patients, the catheters were guided to the opening of the subclavian artery. For stage IIIa patients, the catheters were placed into the thoracic artery through a subcutaneous femoral artery puncture. One to four cycles of chemotherapy (mean, 1.6 cycles) were administered for the patients using taxotere, epidoxorubicin, 5-fluorouracil and/or cyclophosphamide. The interval time between the two cycles was 21 days. Seven cases were identified as complete response (CR, 13.2%), 41 cases were partial response (PR, 77.4%) with a rate of effectiveness of (CR + PR, 90.6%), 5 cases were stable disease (SD, 9.40%) and no case was progressive. Pain of the ipsilateral upper extremity was present in 7 cases. 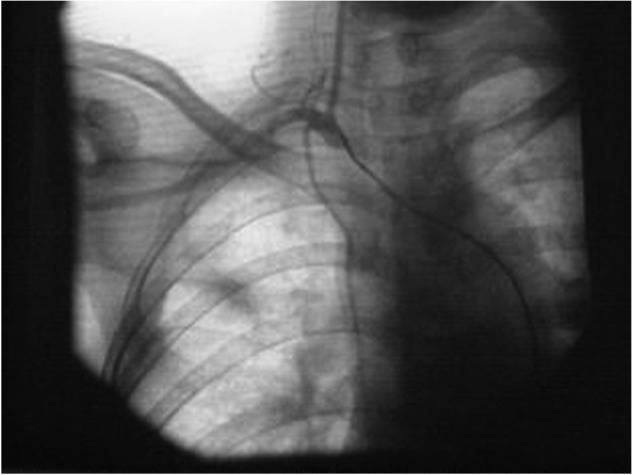 Two cases exhibited ipsilateral upper extremity atrophy following drug administration from the opening of the subclavian artery. One case experienced neck pain and headache, while in one case necrosis of local skin was evident. Hematological toxicity over grade 3 was observed in 6 cases (11.30%). Systemic toxicity was mild and did not affect the quality of life of the patients. Overall survival was identified as 18/51 (35.3%), and free-disease survival as 10/51 (19.6%). In conclusion, intra-arterial infusion chemotherapy is an effective local control treatment for LABC. The main complications are pain of the ipsilateral upper extremity and neck as well as headache. Severe complications are ipsilateral upper extremity atrophy and necrosis of local skin. During the treatment, controlling the pressure of the tourniquet and velocity of drug administration are crucial for reducing local complications. Reageer op "Resaic, een vorm van arteriele chemo embolisatie bij borstkanker geeft uitstekende resultaten zonder bijwerkingen. Fase I studie met 22 patienten bevestigt goede resultaten"